High oil prices and growing concerns over climate change are driving investment and innovation in the biofuels sector as countries and industry increasingly look towards renewable bioenergy to replace fossil fuels. Bill Gates, the world’s richest man, has recently invested $84 million in an American ethanol company, while global energy gluttons ranging from the United States to China are setting long-term targets for the switch to such fuels potentially offering a secure domestic source of renewable energy and fewer environmental headaches. Biofuels are fuels that are derived from biomass, including recently living organisms like plants or their metabolic byproducts like cow manure. Unlike fossil fuels—such as coal, petroleum, and natural gas, which are finite resources—biofuels are a renewable source of energy that can be replenished on an ongoing basis. In general, biofuels are biodegradable and, when burned, have fewer emissions than traditional hydrocarbon-based fuels. Typically, biofuels are blended with traditional petroleum-based fuels, though it is possible to run existing diesel engines purely on biodiesel, something which holds a great deal of promise as an alternative energy source to replace fossil fuels. Further, because biofuels are generally derived from plants, which absorb carbon from the atmosphere as they grow, biofuel production offers the potential to help offset carbon dioxide emissions and mitigate climate change. Biofuels have been around as long as the internal combustion engine, and much longer if you count the biomass used to power horses and other beasts of burden. And with petroleum prices hovering around $70 a barrel, they are increasingly cost competitive with fossil fuels, arousing interest and excitement from the investment community and policymakers alike. Biofuels, which currently are the source for less than 1 percent of electricity in OECD nations, have the potential to provide a quarter of the world’s energy needs within a generation, according to analysts with the United Nations Food and Agriculture Organization (FAO). While other alternative energies—like solar, wind, geothermal, hydroelectric, and tidal—offer viable options for electricity generation, around 40 percent of total energy consumption requires liquid fuels like gasoline or diesel fuel. This is where biofuels are especially attractive, where they can serve as a practical alternative to oil. Currently most biofuel comes in the form of ethanol, an alcohol typically produced from grains or fruit. Ethanol production is booming around the world. For example, in the United States ethanol is growing at 30 percent per year and currently consumes nearly 12 percent of the country's corn harvest. In Germany, biodiesel output is rising by 40-50 percent a year while France aims to triple output of ethanol and biodiesel by 2007, according to The Economist. Nevertheless, America and Europe lag far behind Brazil, the world’s leading user and producer of such fuels. While in 2004, ethanol blended into gasoline made up only 2 percent of all fuel sold in the United States, the South American country of Brazil relies heavily on such alcohol-based fuels. The fuel—hydrated alcohol derived from sugar cane—powers more than two million of Brazil’s cars and produces no benzene or sulfur emissions, and very little carbon dioxide and carbon monoxide. Today ethanol accounts for as much as 20 percent of Brazil’s transport fuel market, and at a production cost of about $1 a gallon—or half the price of conventional oil—offers an economical alternative to drivers throughout the country. The Wall Street Journal estimates that seven out of every 10 new cars sold in Brazil are flex-fuel—capable of running on either traditional gasoline or bioethanol. In Europe, biofuels will play an increasingly important role in transportation. 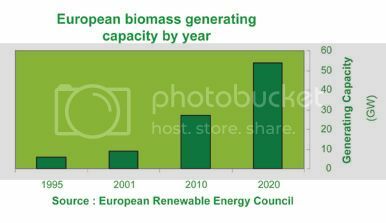 In its "Biomass Action Plan," the EU has set a target of increasing the share of biofuels used in transport to 8 percent by 2015. Already Europe is the world's largest producer of biodiesel—mostly made from rapeseed, soybeans, or sunflower seeds—and output is growing at more than 30 percent per year. Back in the United States, great hopes have been pinned on biofuels, which currently make up 3 percent of total energy consumption in the United States. The Biomass R&D Technical Advisory Committee, a panel established by the U.S. Congress to guide future development of federally funded bioenergy research and development, envisions 30 percent replacement of current U.S. petroleum consumption with biofuels by 2030 under a plan that would require about a billion tons of dry biomass feedstock per year. The strategy, spelled out in a report issued by the Department of Agriculture (USDA) and Oak Ridge National Laboratory of the Department of Energy, suggests that a portfolio consisting of 30 percent agricultural waste, 35 percent forest, 5 percent grains to biofuel, and 30 percent "specialized crops" could meet this objective within a generation, reducing demand for imported oil, curbing missions of greenhouse gases, and strengthening the country's farm economy. Of specialized crops, none is more promising than switchgrass, which is a better source for cellulosic ethanol production, a more efficient and less polluting process than traditional corn-based ethanol production. Cellulosic ethanol is a blend of normal ethanol that is derived from cellulose, the main structural component of plants, and can be produced from virtually any plant matter including agricultural waste. Since such wastes are typically burned or discarded—adding to agricultural production costs as well as carbon emissions to the atmosphere—their utilization as fuel is specially efficient. According to DOE studies, cellulosic ethanol may reduce greenhouse gas missions by 85 percent over reformulated gasoline, while offering significantly higher energy yields and low emissions than sugar and corn-derived ethanol. Further, since cellulose cannot be digested by humans, its production does not directly compete with food production and produces considerably higher yields than traditional grain crops. Plants like switchgrass are excellent feedstock for cellulosic ethanol production and can be planted on marginal agricultural lands. Switchgrass, a perennial grass that once blanketed the central prairies and eastern parts of the United States from the Gulf Coast to Canada, offers perhaps the best potential as a source of biofuel in America. Studies conducted at Auburn University found the plant yielded an average of 11.5 tons per acres over a five-year period, enough to make 1,150 gallons of ethanol per acre per year (1,750 liters per hectare per year), or more than three times the yield of traditional corn-based ethanol. Further, once you factor in the energy required for tractors, transport, and fertilizers, the net energy output of switchgrass is 15 to 20 times better than corn’s. In other words, it requires far less land and energy to produce a gallon of fuel derived from switchgrass than it does from corn, sugar, or soy. Beyond efficiency, switchgrass offers advantages over gasoline and standard ethanol. Hardy and adaptable, as a perennial, switchgrass can be harvested as a cash crop on an annual or semi-annual basis without replanting for 10 years. The species has multiple uses—ethanol feedstock, forage, ground cover—giving a farmer several options depending on market conditions. It can be also utilized for chemical products useful for making fertilizers, solvents, and plastics. The plant can be harvested with standard farming equipment, requiring minimal additional capital investment for farmers. From an ecological standpoint, unlike annuals which deplete soil of nutrients, switchgrass restores organic nutrients to over-farmed and otherwise degraded lands. Further, the plant's deep roots anchor soil, reducing erosion and filtering runoff before it enters waterways. While switchgrass looks promising in its natural form, through selective breeding researchers at leading universities are working to boost yields and increase the adaptability of the plant for growing under a variety of conditions while reducing the need for chemical fertilizers. A study released recently by Carnegie Mellon found that ethanol derived from switchgrass could be made in sufficient quantities to deliver 16 percent ethanol fuel to all consumers in the U.S. by 2020. Globally, there are benefits from biofuels that extend beyond resource security and the environment. The FAO highlights the poverty alleviation potential for energy crops by bolstering crop diversification, allowing farmers to offer their crops at the best price for food markets or energy markets. "Farmers, particularly in tropical areas, are seeing new opportunities for increasing production and raising their incomes," said Gustavo Best, senior energy coordinator at the FAO, in a statement on bioenergy. "The beauty of bioenergy is that production can be tailored to local environments and energy needs. Where there’s land, where there’s farmers, where there’s interest, bioenergy may be the best option. And if we add some sound analysis and good business models, we will get that option right." While bioenergy appears to offer hope for a bright future, it also presents concerns and faces significant challenges. 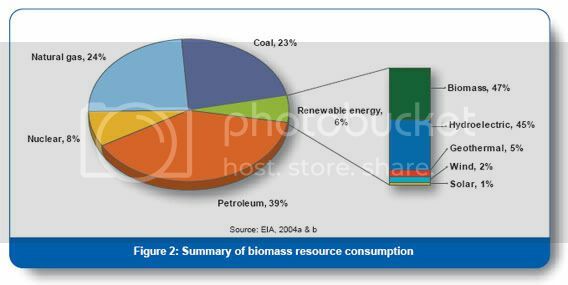 Beyond supply logistics issues, including how to efficiently harvest, transport, store, and process biomass feedstock, there are potential environmental conflicts that arise with energy crop production. Land-use competition (food versus fuel conflict), the use of nitrogen fertilizers and pesticides, and the conversion of natural vegetation for biomass plantations are the foremost concerns for environmentalists. For example, in Malaysia and Indonesia, vast swatches of biodiverse rainforest have been replaced with oil palm plantations, while in the Amazon agricultural expansion has put ecosystems at risk. For these reasons, many green groups actively oppose bioenergy development projects in the tropics. Some have called for certification schemes that would ensure biofuels are derived from sustainable sources. Also of concern is the volatile nature of energy markets. While market forces—high energy prices—are rapidly improving the environment for the adoption of biofuels, a significant drop in oil prices could cause efforts to stumble. Under such a scenario governments could take steps to encourage the nascent bioenergy market including reducing subsidies for fossil fuels which distort the true costs of hydrocarbon use; levying an environmental tax on fossil fuels to bear the full cost of fossil fuels; and redirecting existing subsidies, which currently top $20 billion dollars a year in the United States alone, toward promising bioenergy crops. It is now clear that as oil becomes increasingly scarce, economics will continue to drive bioenergy development. As Alexander Müller, assistant director-general for the Sustainable Development Department of FAO, says, "The gradual move away from oil has begun . . . . Oil at more than $70 a barrel makes bioenergy potentially more competitive [while] in the last decade global environmental concerns and energy consumption patterns have built up pressure to introduce more renewable energy into national energy plans and to reduce reliance on fossil fuels. "Over the next 15 to 20 years we may see biofuels providing a full 25 percent of the world’s energy needs," he adds.